View More In Recessed Lighting. No UV or IR in the beam. Instant start, NO flickering, NO humming. Turn off electrical power before starting installation of light fixture. The input voltage and lamps should be matched, after connecting the power line. Please make sure the wiring section is insulated. This product must be installed in accordance with the applicable installation code by a person familiar with the construction and operation of the product and the hazards involved. Caution- risk of fire. Consult a qualified electrician to ensure correct branch circuit conductor. ✔ SAVE 87% IMMEDIATELY. Save 87% on your energy bill by replacing 120W with 15W LED. Up to 35,000 Hours of Life. ENERGY STAR certified. ● EASY INSTALLATION: Easier to install than a traditional LED Downlight. 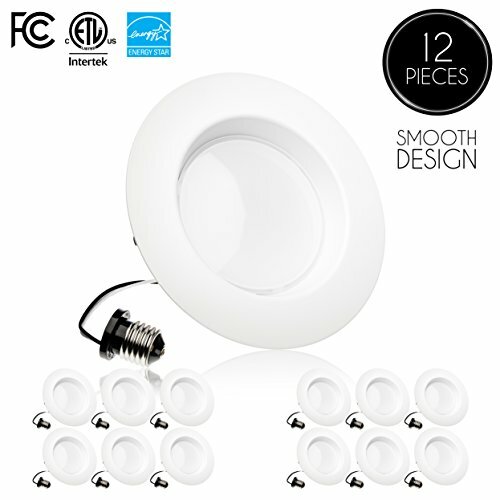 Instead of the traditional springs you see on most LED Downlights, our 5/6" 15W Smooth Downlights come with "teeth" like grips which install easier and more secure. They are ready to fit in 5" or 6" recessed Downlight housing cans directly, new and old. No additional accessories are required. ● CERTIFICATIONS: ENERGY STAR certified which means our products meet strict requirements to be considered energy efficient and reliable. ETL-listed to avoid electrical shock and fire hazard making our LED Downlights extremely safe. Additional certifications: FCC compliant, Title 24 , Wet Location rated. ● DIMMABLE. Compatible with most LED dimmers. Compatible with Caseta wireless dimmers. If you have any questions about this product by Parmida LED Technologies, contact us by completing and submitting the form below. If you are looking for a specif part number, please include it with your message.